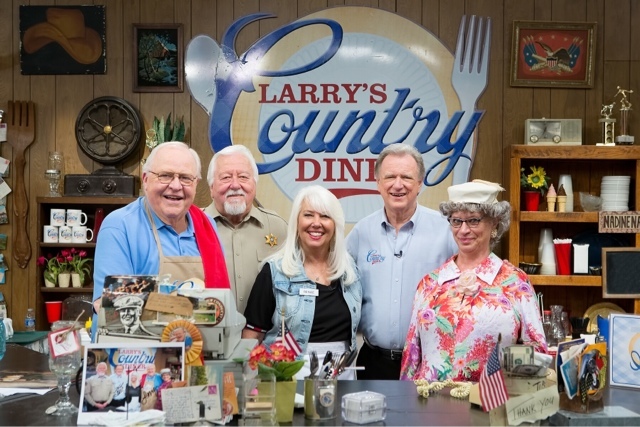 NASHVILLE, Tenn. (August 1, 2016) – The national hit television series, “Larry’s Country Diner,” will continue to entertain audiences in August with re-airing of popular episodes featuring guest starsDarrell McCall, Doyle Dykes, Johnny Lee, and The Dillards. The pairing of undeniable talent and entertaining stories from these country and bluegrass favorites make for episodes you’ll want to watch again and again! Tune in on Thursdays at 8 pm / 7 pm CT and Saturdays at 11 pm / 10 pm CST to RFD-TV. Enter your zip code here to find RFD-TV in your area. Fans can also participate in Renae The Waitress’s weekly Diner Chat via phone where she shares behind-the-scenes secrets of the show, answers viewers’ personal questions and features exclusive interviews with celebrity guest stars on Thursdays at 2 p.m. CST. For more information on Diner Chat, please visitlarryscountrydiner.com/dinerchat. As construction on the new brick-and-mortar diner continues in Bellevue, Tennessee, “Larry’s Country Diner” fans are invited to forever become a part of the “Larry’s Country Diner” Legacy Walkway by personalizing a commemorative brick that will pave the restaurant’s entrance. For more information on how to personalize a brick, please visitlarryscountrydiner.com/product/larrys-country-diner-brick.